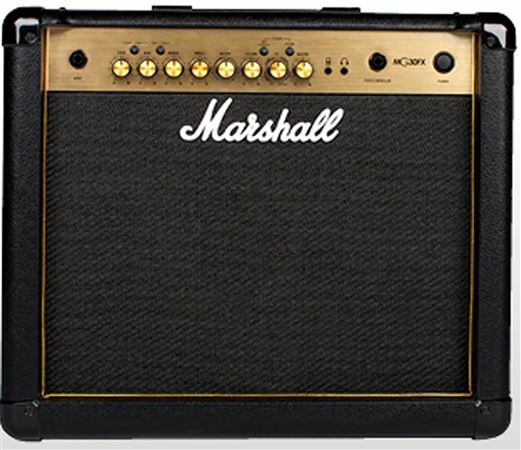 Order your Marshall MG30GFX Electric Guitar Amplifier Effects Combo 1x10 30 Watts from AMS and enjoy 0% Interest Payment Plans, Free Shipping, Free Extended Warranty & 45 Day Money Back Guarantee. A lightweight powerhouse amp you can play at home, in the practice space or on stage! The MG30GFX is loaded with features including built-in effects and the versatility of 4 channels to easily dial in the ideal tone for your sound. 30 watts of power makes it perfect for practice and small gigs while line-in and emulated headphone out make it ideal or at-home jamming. This is a great amp, has a nice clean sound, with the optional crunch I like. Plenty of settings, perfect size, and great sound. Bought this to go with my Epi Les Paul and works great. Clean sounds phenomenal and the reverb is pretty cool. Overall, very satisfied with the features on this amp. Super amp with a lot of options. The MG 30 with my Jackson Dinky is a great match. Awesome sound and effects. AMS is an amazing company that really takes care of their customers... Will be giving them more business in the future for sure..